It is a good day for Republicans in Virginia. In fact it has been a good two years. But while the GOP is still reveling in a series of victories that have delivered all three statewide elected seats and now eight of the Commonwealth’s 11 Congressional districts, don’t expect this to usher in dominant Republican rule. It may actually point to evidence that the Virginia voter is fickle and willing to change its mind in a very short turn of events. Remember the Old Dominion’s two senate seats still belong to Democrats and Virginia went Blue for Barack Obama in 2008. 2012 is still two years away and much can change. I broke down the changing map last night during NBC12’s Decision Virginia coverage. Our political analyst Dr. Dan Palazzolo helped to put things into perspective and predict what it could mean for the future. The results are still coming in, but local Congressman Eric Cantor has posted an expected victory over two opponents in Virginia’s 7th Congressional District. With 70% of the votes counted, Cantor leads Rick Waugh and Floyd Bayne 59-43-7 respectively. The early returns look good for Republicans taking control of the house and that could mean Cantor will be the next Majority Leader in the House of Representatives. 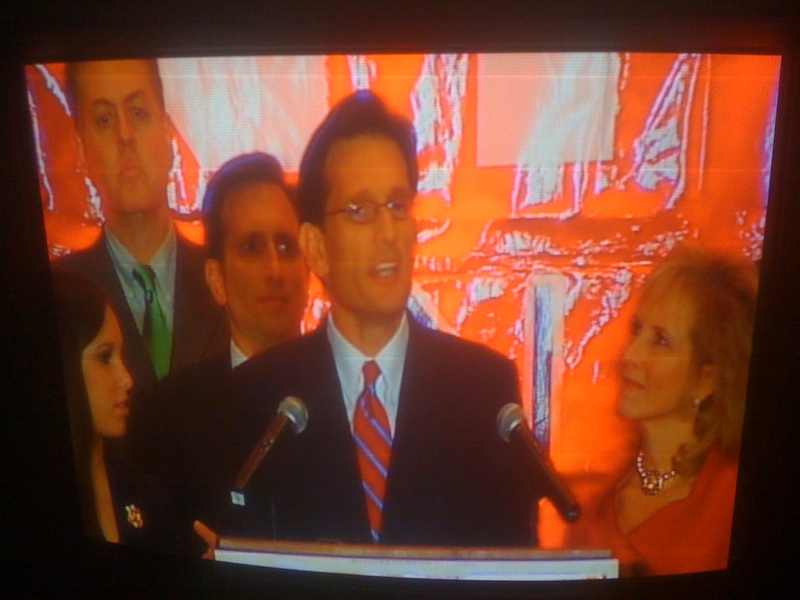 Cantor’s address to supports from the Hilton in Short Pump, was broadcast live to NBC affiliates across the country. Perhaps an indication of how powerful he is about to become. Election day 2010 has arrived. The federal midterm elections are never as important in Virginia as they are in the rest of the country. The Commonwealth elects its state based offices on opposite years of the federal elections. But regardless, today still carries tremendous weight, because all 11 of Virginia’s seats in the House of Representatives is up for a vote. Several of them are among the hottest races in the country, and because Virginia is one of the first states to close its polls, it may provide some clue to the rest of the country as to how the night will progress. 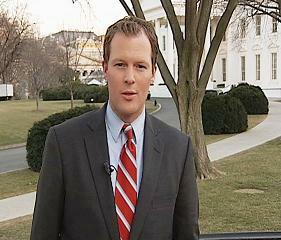 We have complete coverage tonight on NBC12 News. NBC is carrying a special two-hour Decision 2010 special and within that broadcast we will have local updates on how the local races look. In addition we will have the local results continuously scrolling along the bottom of your screen. *Andy Jenks will be live in Short Pump, where Rep. Eric Cantor will watch the results. Results that could lead to him becoming the presumptive Majority Leader in the House of Representatives. *Rachel DePompa will be in Charlottesville covering one of the most watched races in the country. She will be there when Rep. Tom Perriello finds out if he was able to hold on to his seat. *Tara Morgan will travel to Chatham to cover State Senator Robert Hurt‘s bid to unseat Perriello. *Nicole Bell will cover the interesting developments in Petersburg. One of the few local races of interest. Longtime Mayor Anne Mickens is trying to hold her seat through and unconventional write-in campaign. *I will be live in the studio with Curt Autry and Sabrina Squire. As we watch the returns, I will put Virginia’s results into context of the national picture on how our local races could impact the rest of the country. *University of Richmond professor, Dr. Dan Palazzolo will have analysis of what we learn throughout the night. In addition to the candidates running for office. There are also three proposed amendments to the Virginia constitution. You can get a full rundown of what to expect on NBC12.com. Election 2010 appears to be one of the most important of Rep. Eric Cantor‘s political career. The local Congressman has been one of the lead architects in the GOP resurgence that is on track to retake the House of Representatives and by extension make Cantor the 2nd most powerful member of Congress. But while Cantor has been rallying Republican troops around the country, his own re-election has inflicted a bit of damage on his local persona. There is a perception that the Congressman hasn’t not been very accessible during his campaign. Cantor’s opponents Democrat Rick Waugh and Tea Party candidate Floyd Bayne have complained about Cantor’s unwillingness to stand with them and debate the issues. Both have used unconventional means to get the Congressman’s attention. Waugh has sent a man dressed in a chicken suit to interrupt Cantor events. Bayne confronted Cantor at a recent book signing with a video camera in tow. Of course, all of these incidents get captured on YouTube. But while those confrontations did not amount too much, one incident attracted national news. A supporter of Waugh, Jon Taylor attempted to attend an event advertised by the Cantor campaign as “open to the public”. Depending on which perspective you read, Taylor was either minding his own business or causing a disturbance. Regardless he was asked to leave and refused and was eventually arrested. His arrest, which he resisted, was caught on camera by his son and has now received over 50 thousand views on YouTube. The series of conflicts at Cantor events led well-known Bacon’s Rebellion blogger and respected journalist Peter Galuszka to say that Republican “has a tendency to surround himself with layers of defense.” Galuzka’s column was cross-posted on the Washington Post’s “All Opinions Are Local” page. 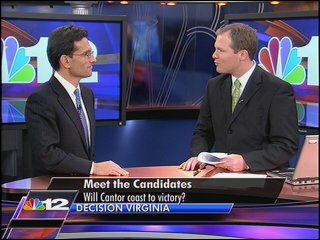 Monday on NBC12 First at 4, Cantor flatly rejected that claim. And when I pressed him about the lack of access and specifically about the incident in Louisa, Cantor claimed that was an isolated occurence and that Democrats and Independents are always welcome at his events. Cantor went on to say, that his role in the national debate make him a known quantity. If a voter wanted to know where he stands on an issue, its not hard to find out. You can see the complete interview with Rep. Cantor below. The full transcript is available on NBC12.com. President Barack Obama comes to Charlottesville tomorrow to stump for Congressman Tom Perriello‘s re-election bid. Unlike the President’s invitation only event in Richmond a few weeks ago, this event is open to the public on a first come, first serve basis. Public entrance is between 5th and 6th Streets NE, on the Downtown Mall. I will be there reporting live for NBC12 starting at 4pm. I’ll try to post interesting tid-bits here on Decision Virginia, but I am sure my twitter feed will be busy. If you aren’t following me now, join the thousands who already are! Twitter.com/ryanobles. Meanwhile the Richmond Tea Party is planning a counter rally to the President’s rally. The details for that event can be found on their website by clicking here. State Senator Robert Hurt, Perriello’s opponent will be pretty far away from Charlottesville. He is hosting a small business round table in Martinsville. Like many of his counterparts in this unconventional election season, Libertarian candidate James Quigley is hoping to overcome incredible obstacles to win this November. The third-party candidate for Congress is challenging longtime incumbent Bobby Scott to represent Virginia in Washington. Quigley believes Scott has let down the people of the district, but he also feels that the Republican alternative Chuck Smith, isn’t much better. It was an incident that drew his re-election bid into the national spotlight, even though he had nothing to do with it. Rep. 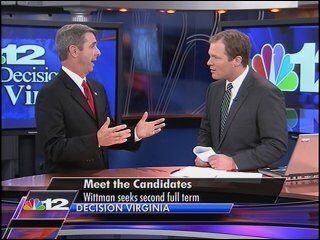 Rob Wittman was facing a low profile, but fiesty challenge from first time candidate Krystal Ball. It was low profile of course, until suggestive photos of Ball leaked on the internet. From there Ball quickly became a national media sensation. She appeared on all three national cable outlets and wrote an editorial in the Huffington Post. Meanwhile, Wittman himself didn’t comment on the issue, and for the most part wasn’t sought after for his take. In an interview on NBC12 First at 4, the incumbent Republican said he was surprised at the reaction the story recieved. Surprised in particular by the number of national apperances Ball made. An argument can be made that Ball has actually benefited by pictures being released. That was something Wittman did not want to speculate on. Wittman also discussed the federal minimum wage and his proposals to cut spending. You can see the entire interview below. A transcript is available at NBC12.com.